On March 1st, the City of Frederick approved and adopted the Plug-In Electric Charging Infrastructure Plan. 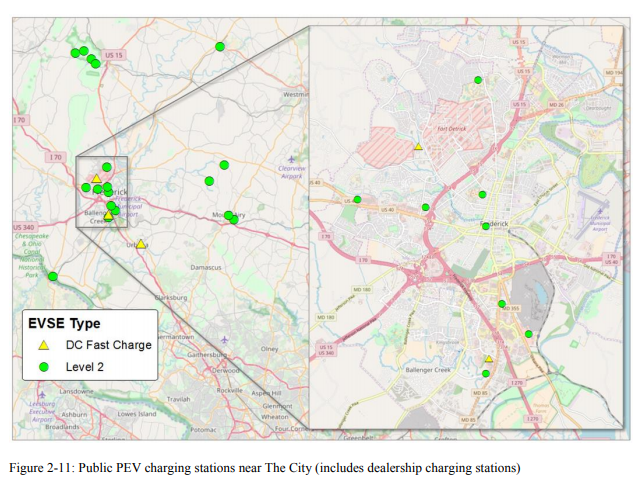 The plan evaluated the current conditions of Plug-In Electric Vehicle (PEV) use in Frederick and created a roadmap for increasing the number of charging points in the City. Frederick County currently has 420 registered PEVs – positioning the County as 7th (of the State’s 24 counties) in percent of total vehicles that are PEVS. There are currently 8 publically-available and easily accessible Level 2 PEV charging locations within the City of Frederick, with additional station locations in the surrounding areas of Mount Airy, Point of Rocks, Sabillasville, Taneytown and Thurmont. Two more private locations are reserved to service cars in the City’s municipal fleet – which features one fully-electric Nissan Leaf and several Pruises. The roadmap for Frederick’s future electric infrastructure development – which can be viewed in its entirety here - focuses on easing and incentivizing private investment. The City looks to pursue initial PEV-ready procedures and train City staff to streamline the permitting process, which will in turn allow residents a clearer, more cost-effective path towards personal installation. Concurrently, the Maryland Energy Administration is working with Marylanders to expand the State’s growing electric vehicle recharging infrastructure through the Electric Vehicle Supply Equipment Rebate Program. More information can be found here. Older PostVisualize 2045: What's the plan?